CAELEX/CHRIS AUTO are direct importers and online distributors of high quality auto electrical parts for most makes of vehicles. We source parts from reputable manufacturers. Our parts are brand new, affordable OE Specification aftermarket replacement products. 100% Factory tested and built to strict quality control standard to ensure high performance and guaranteed to deliver better fuel economy. We deliver nationwide and most products can be delivered to your door. Try us for professional parts in Alfa Romeo, Audi, BMW, CAM, Chana, Chevrolet, Chery, Chrysler, CMC, Citroen, Daihatsu, Dodge, Fiat, Foton, Ford, Golden Journey, Gonow, Geely, GWM, Hafei, Haise, Honda, Hyundai, Jaguar, Jeep, Jinbei, KIA, Land Rover, Lexus, Mahindra, Mazda, Mercedes, Meiya, MG, Mitsubishi, Mini, Morgan, Nanfeng, Nissan, Peugeot, Polar Sun, Proton, Renault, Seat, Ssangyong, Subaru, Suzuki, Tata, Toyota, VW, Volvo AND MUCH MUCH MORE. These terms and conditions together with the documents referred to in them, tell you the basis on which we will supply to you our goods, “Goods” and services, “Services”. Please read these terms carefully before ordering any Goods or Services from us. By ordering any of the Goods or Services, you agree to be bound by these terms. 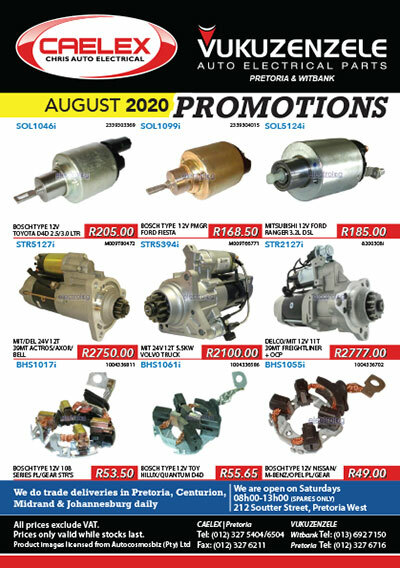 1.1 The Goods and Services are provided by CAELEX / Chris Auto Electrical (pty)ltd., “we/us/our”. 1.2 We are registered at the offices of the CIPC, South Africa. Goods and/or Services is accurate, complete and not misleading. 3.2 If you are purchasing Goods and/or Services "Order/Ordering" via our website domains, "caelex.co.za" or "vukuzenzele.co.za", no contract for the supply of Goods and/or Services, “Contract” will come into existence until and order is confirmed via the checkout process of our website, and you or we receive an order confirmation of your order placed, or until we dispatch the Goods, send you an email confirming that your Goods have been dispatched or start performing the Services related to placing an order for Goods or Services via our website, whichever is the earlier. 3.3 Each order for Goods and/or Services by you to us will be deemed to be an offer by you to purchase Goods and/or Services subject to these terms. Each separate order placed by you to us for Goods and/or Services and accepted by us will constitute a separate order and contract. 4.2 We reserve the right to deliver Goods of a modified design provided that any difference does not make the Goods unsuitable for your order or any purpose you have made known to us. 4.3 We retain all copyright and title to all documentation relating to Goods delivered to you by us. This documentation may only be used for the purposes intended in the Contract and not for any other purpose without our permission. It must be returned or relinquished on request or demand. 4.4 Technical specifications are approximations unless specifically stated otherwise. 4.5 You will not remove, alter, deface, obfuscate or tamper with any of the trade marks, names or numbers affixed to or marked on the Goods nor allow anyone else to do so. 4.6 If the Goods are manufactured in accordance with any design or specification provided or made by you, you will compensate us in full on demand for all claims, expenses and liabilities of any nature in connection with them, including any claim, whether actual or alleged, that the design or specification infringes the rights of any third party. 4.7 We prohibit the audio or video recording of our website, physical facilities, on-site professional or technical Services, or training and consultancy without the prior written consent of us. for the Goods in accordance with our refunds policy which is available on request. This right of cancellation does not apply to any Goods damaged or used by you, or personalized and/or made to your specification by us. 5.2 Except electronic items which will not be refunded or accepted for return, to cancel an order, you must inform us in writing via email to telesales1@caelex.co.za . You must return the Goods to us, un-used in the same condition in which you received them with the original packaging and the product documentation, and at your own cost and risk. The Goods must not have been used and, where applicable, must not have been removed from their packaging. This includes all items supplied in sealed clear packaging. 5.3 Subject to clause 5.2, if you want to cancel the Contract or have been supplied with Goods which are incorrect or defective, you must notify us within 5 working days from the date of delivery (the“Cooling-Off Period”), in which case a refund, (or if you require an exchange or replacement) will be provided. You will only be entitled to a refund if your notification is provided within the Cooling-Off Period. In the event that notification is given after the expiry of the Cooling-Off Period, save where Goods are defective, we reserve the right to issue only an exchange or replacement. 5.4 We shall have no liability for incorrect Goods purchased by you online for foreign registered cars once the Cooling-Off Period lapses. 5.5 Details of how to exercise this right of cancellation can be obtained by calling our finance department. 5.6 You may also cancel an order for Services by calling the telephone number notified to you, within 5 working days of the date of purchase, unless the Services begin sooner, in which case your right to terminate ends upon the date when performance of the Services or Contract starts. 6.1 The prices of the Goods and Services will be as quoted in our on-line store and marketing literature from time to time except in cases of obvious error (see clause 6.7). The prices may be altered at any time without notification to take into account any increase in our costs (including but not limited to the cost of materials, labour, transport or other overheads, any tax, duty or variation in exchange rates). 6.3 We list prices as inclusive of VAT. All prices are exclusive of any other sales tax or duty that may be applicable which will be payable in addition to the price unless otherwise stated. 6.4 Unless otherwise specified, prices quoted during the checkout phase of our online store, include delivery to destinations inside the Republic of South Africa and we will select the mode of transport which is most cost and time effective. The entire cost of any other mode of transport which you may specify will be borne by you, as will delivery to locations outside of the Republic of South Africa. Delivery costs will be quoted at the time you place your order for Goods via the checkout phase of our online store. 6.5 In the case of small orders we will be entitled to make a minimum order charge or to add a surcharge for delivery, details of which will be provided to you at the time of or briefly after your order acknowledgement. 6.7 You acknowledge that we stock a large number of Goods and list a large number of Services. It is always possible that, despite our best efforts, some prices may be incorrectly listed. We are under no obligation to provide Goods or Services to you at an incorrect, lower price, even after we have acknowledged your order or dispatched the Goods or started performance of the Services, if the pricing error is obvious and unmistakable and could have reasonably been recognized by you as mis-pricing. 7.1 Unless otherwise stated all quotations and pricing are valid only for 7 days from their date of publication, which in the case of the online store, is daily. 8.2 Where you do not hold a credit account with us, payment of invoices will be made in full to us without deductions or set-off in cash/guaranteed cheque/credit or debit card when order is placed. 8.4 Payments by credit or debit card will only be accepted where the card in question has been verified on our website. • &quot;MDS&quot; shall mean MDS Collivery (Pty) Ltd, its staff, agents or sub-contractors. • &quot;Goods&quot; shall mean any documents, parcels or freight accepted for carriage by MDS. &quot;Carrier&quot;) using means it deems suitable. • &quot;Client&quot; shall mean the party responsible for the payment for the carriage of the goods. • &quot;Owner&quot; shall mean the party who has a financial interest in the goods. • &quot;Parties&quot; shall mean the Client, the Owner, the sender, the receiver or the Carrier. handover of the goods from one party to the other. • MDS is not a public/common carrier and may refuse to accept any goods for carriage without providing reason for such refusal. • By using our collection and delivery service you agree to be bound by our terms and conditions, as set out in this document, and you acknowledge that our terms and conditions will constitute a valid, binding and enforceable agreement. • These terms &amp; conditions shall apply to all transactions concluded by or on the Client&#39;s behalf on our website. (www.collivery.co.za or collivery.net). • A certificate issued by an administrator of our website shall constitute prima facie proof of any fact related to our website, including (but not limited to) which version of the terms and conditions govern a particular dispute and what content was published or functionality was available on our website at a specific point in time. • For purposes of Section 22(2) of the Electronic Communications and Transactions Act, 25 of 2002 you accept that the agreement will be regarded as concluded at Randburg, Gauteng Province. • All matters arising from this agreement, its validity, existence or termination shall be determined in accordance with the laws of the time of the Republic of South Africa, and you hereby submit to the jurisdiction of the Magistrates&#39; Court of Johannesburg/Randburg. • MDS&#39; prices are set out in its price list or are as negotiated or quoted to the Client and are subject to review from time to time. • Prices quoted are based on the information provided by the Client. Should this information be found to be incorrect, MDS has the right to adjust the prices based on the correct information while continuing with the carriage. • Any credit limit, invoice frequency, or payment terms set by MDS shall be at its sole and absolute discretion and may be changed by MDS depending on circumstances that MDS believes justifies such changes. • Will terminate once proof of delivery has been obtained from the receiving party at the address stated on the waybill. • Shall be limited to an amount of R1 000.00 (One Thousand Rand) subject to Clause 3.1(d) below. • Shall exclude indirect and consequential damages. • Where MDS has agreed to accept the additional risk of carriage, such risk shall never exceed an amount of R10 000.00 (Ten Thousand Rand) relating to any one waybill. This risk relates to the loss of goods, and does not cover damage resulting from inadequate packaging of the items by you or your agents. This acceptance of risk relates exclusively to the direct cost of replacement of goods, and shall in no way cover any indirect or consequential losses. • Any claim for loss must be lodged within 7 (seven) days of such loss by sending an e-mail to claims@collivery.co.za. Any claim lodged after such period will not be considered. • Any documents requested to support the claim which has not been submitted within 2 months from the date of loss will result in the claim not being considered. • MDS shall not be liable for failure to fulfil its obligations if such failure is due to war, civil disobedience, industrial dispute, acts of God, or any event beyond MDS&#39; reasonable control. • If MDS is unable for any reason to effect delivery of the goods, all reasonable steps will be taken to return the goods to the Client. The Client will, however, be responsible for the costs of carriage, attempted delivery and return of the goods. Any failure to deliver or any late deliveries may not be used as motivation for non-payment for that delivery. • MDS will not be responsible for any fulfilment of Customs formalities or payments. However, MDS will assist the Client as far as possible, on condition that such assistance will be rendered at the sole risk and responsibility of the Client and the Client undertakes to indemnify MDS against any claims in this respect. • The goods are accurately described on the waybill. • The waybill is printed and affixed to the parcel. • The goods are adequately packed and accurately addressed on the system generated waybill to enable delivery to take place with ordinary care and handling. • The Client has to the best of its knowledge and belief, complied with all laws, rules and regulations regarding the carriage and that the goods are not prohibited by Government regulation. • The Client agrees to MDS&#39; terms of payment and that MDS shall be entitled to suspend, delay and/or cancel collection and/or delivery of any consignment(s) in the event of non-payment, or to hold the consignment(s) until such time as the account has been settled in full or to MDS&#39; satisfaction. • Failure to pay your account within 30 (thirty) days from the date of delivery of a tax invoice will attract interest at the rate of 24% per annum in terms of the National Credit Act. • You will be liable for all legal costs incurred by us on a scale as between attorney and Client, (including, but not limited to Sheriff&#39;s fees, collection commission and tracing agent&#39;s fees) in the event of us having to institute legal action in order to secure payment of any outstanding account. • Where the Customer fails to submit the Claim to MDS within the relevant time limits set out above. • Where MDS is in possession of an unendorsed proof of delivery form for the consignment. • Money, bullion, credit cards, pre-paid cards, jewellery, watches, precious stones, furs, treasury notes, securities, stamps, patterns or manuscripts, plans, designs, explosives and all livestock or plants, guns, ammunition, hazardous goods and dangerous goods / materials, negotiable instruments, gemstones, antiques, works of art, securities, drugs, all framed pictures, artwork, solar panels or parts, mirrors and negotiable instruments, including collectible coins, cellphones, furniture and antiques are carried entirely at your risk. Second – hand goods that have not been declared as such to MDS, who reserves the right to inspect second hand goods before acceptance and to delay the transit time by one day to effect such inspection. • Where MDS in its reasonable opinion considers the Packaging of the Goods to be inadequate for rail, air or road transportation. in the event of a claim for damage, the receiver must retain all inner and outer packaging materials as well as the damaged goods. Failure by the receiver to retain the original goods and packaging at the original delivery location or the failure to make the delivered goods available for inspection will invalidate the claim. • Where the Goods are determined by MDS to have been defective prior to the Carriage. • Where damage, mechanical failure or other operational defect in the Goods could not, in the reasonable opinion of MDS, have been caused by the Carriage. acceding to the demands of the employees responsible for such action), acts of God, war, terrorism, fire, flood, embargo, litigation, acts of government or any agency instrumentality or any political subdivision thereof or any other cause beyond the control MDS. • Where the goods have been lost or damaged as a result of derailments, collisions, overturning or any similar incident. • Where the Goods have not been packed in the original manufacturer&#39;s packaging or the equivalent. • Where the Delivery Address is a post office box, a roadside drop or postal mail box. • MDS reserves the right to amend these terms and conditions of contract from time to time, without prior notice to the Customer. 14.1 We stock an ernormous catalog. We try our best to always have the item but in the event that you have purchased an item thats &quot;in stock&quot; and later find that this item is not, we have the right to source the goods withing seven (7) days failing which we are not obliged to honour the sale and will refund your purchase with 72 Hours.